I came of jazz age listening to the Modern Jazz Quartet in my early 20s. I never saw them live, but Milt Jackson was my introduction to the vibes, and I have been in love ever since. In the Twin Cities we have a 21st century answer to the MJQ, and I suspect that if this was New York, the Phil Hey Quartet might be held in similar regard. They swing and sway and go into orbit nearly monthly (usually the 4th Thursday) at the Artists Quarter. Last weekend they had a rare Friday/Saturday gig that might have been their most inspired yet. I had the opportunity to hear them in a more sedate concert setting Sunday afternoon when they performed at Schmitt Music Center’s Edina performance studio for the Osher Lifelong Learning Institute’s Jazz Appreciation Group (fondly known as the OLLI Cats). Despite the more formal venue, the PHQ played with the same joyful abandon as they had displayed into the wee hours the night before. Once ignited, they just kept burning, each musician fueling his cohorts. Each member of the quartet has plenty of chops to spare and each is a familiar sight and sound at local jazz haunts. Leader Phil Hey was often called out of town to perform with the late Dewey Redman and otherwise is a frequent supporter of such acclaimed artists as Laura Caviani, Pete Whitman, Lucia Newell and Gordy Johnson as well as many national touring musicians. Pianist Phil Aaron similarly is on call to visiting stars and local luminaries, an elegant stylist with an Evanescent touch. Bassist Tom Lewis is one of the most versatile of pacesetters, appearing throughout the area with mostly small ensembles, instrumental or vocal. And Dave Hagedorn, one of the few local vibes artists but easily comparable to the best in the nation, performs far less frequently than his talent demands. In 2006, the quartet finally got around to recording a representative sampling of their eclectic repertoire, from Hey’s original title track Subduction to covers of Irving Berlin, Charles Mingus, Ornette Coleman and John Coltrane; vibes master Bobby Hutcherson’s “Highway One,” a lovely tune from Marc Copland (“Darius Dance”), and my favorite, Don Cherry’s “Mopti.” It’s the longest track at nearly 13 minutes, and last weekend I heard it twice live, Saturday night at the Artists Quarter and again by request at the OLLI concert. It’s the penultimate PHQ collaboration, a beautiful melody filled with rhythmic excitement that seems, inevitably, to prompt gleeful interaction among the musicians. “Mopti” is named for the African city that sits on three islands, known as the “Venice of Mali.” Like the rivers that converge on the city, the composition flows together as Africa meets postbop. Dave Hagedorn opens with melodic statement that’s already an improvised bit of celestial seasonings, setting the tone for the rest of the band. Evolving with a sense of joyous urgency, a tribal chant underlies the main voice as Phil Hey sets a forceful percussion line in motion. Like stirring a pot of surprise ingredients, the musicians add successive layers, a contrapuntal partnership played out between piano and bass, Phil Aaron bringing a level of energy to the music seldom suggested by his usual tasteful comping in other contexts. Tom Lewis similarly is not often heard engaging his fertile imagination so unfettered, but the laughter captured on record as well as the enthused audience reaction in live performance provides ample justification for more. The centerpiece however belongs to the leader as Hey takes an extended solo (live as well as recorded) that showcases the vast array of sound available within a standard trapset, finally aligning with Hagedorn to tag team a forceful conclusion. Here, there is no substitute for live performance. Next best thing to a live performance is a rendition of “Mopti” captured by Don Berryman and posted on You Tube at http://www.youtube.com/watch?v=SydFOyaYbts. Unfortunately, the sound doesn’t do the band justice. You’ll have to come down to the Artists Quarter. Close your eyes and you could be at the Village Vanguard. But keep them open, you don’t want to miss the grins. One will be yours. 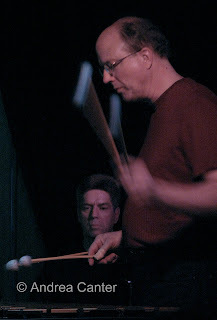 Photo: Dave Hagedorn swings the mallets over leader Phil Hey at the AQ on March 29, 2008. Photo by Andrea Canter.